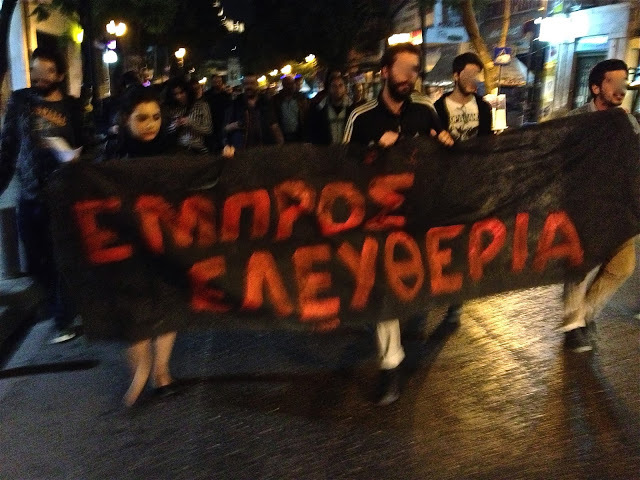 On October 30 2013, police officers from the Acropolis police station arrested two young actors who were holding rehearsals at the free self-managed EMBROS Theater. The two arrested actors were led to the prosecutor, where they were charged with the breaching of seals, disrupting domestic peace, and repeatedly occupying a public building. They are currently detained, and will be tried on 31/10/2013 with a flagrant process. The Open Assembly of the free self-managed EMBROS Theater moved forward with a night protest, marching together from EMBROS to the Acropolis Police Station, on Thursday October 31 2013, at 12pm noon to the flagrant process “Aftoforo Monomeles Plimmeliodikio Scholis Evelpidon” (Building 2) to show support for the arrested and resistance towards authoritarianism of power. We could have understood if it was a bad example of science fiction, but it’s not. And it’s not a show. Unfortunately, it’s true. 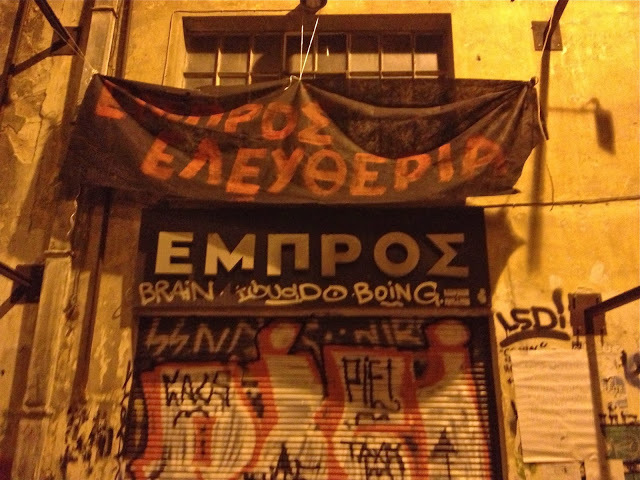 Two actors from Embros Theatre in Athens were arrested because they committed the most atrocious of crimes: rehearsing. But maybe it was because this crime is aggravated by others which are even worse, when they become possible: reclaiming public space, practicing commons and believing in culture as a primary right. This authoritarian, illogical, and repressive act of arrest is simply unacceptable. As we are able, from Rome, we would like to RE-ACT! Participants of Embros: What you’re building together is strong, durable and inspiring. We are with you with eyes and heart wide open. This letter is a small gesture of solidarity, but we really want to encourage you guys to never give up. I am Jenny Marketou (Athens/New York) interdisciplinary artist and educator based inNew York City. As a cultural practitioner during my frequent visits in Athens I had the opportunity to attend several events organized at Embros Theater. I realize that at times of crisis culture is a crucial and active ingredient in the construction and shaping of the contemporary city like Athens and Embros Theater provides a unique global platform which showcases and hosts artistic practices, campaigns, theories, and practicalities that accompany this phenomenon. It is unethical to prosecute people who have battled to endure this space and who have contributed in creating arts communities, which are invested in the connection between social justice and art with an impact on the viability of the city. With this letter I am asking your profound consideration on this matter and all efforts to prosecute individuals or directed against Embros should be dropped immediately. do you get fries with that?